Free range private land hunting equals, high animal numbers, high trophy quality, game management, exclusive access and comfortable accommodation. We have access to six outstanding free range private land hunting properties totalling over 250,000 acres, with wild free ranging animals amongst stunning mountain and lakeside surrounds. These large private free range properties are predominantly sheep and cattle ranches or farms that have populations of wild game animals, we work closely with land owners assessing each season how many trophy male animals can be taken. This is usually a very limited number, depending on population generally ranging between 3 to 6 free range trophy animals. We have sole access to an exceptional 50,000 acre free range property for genuine Otago red stags. We have good free range private properties for hunting tahr and fallow deer, chamois being the only animal you will not find in large numbers. 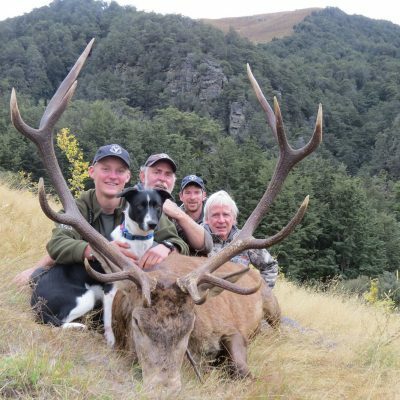 Free range private land hunting offers the hunter a truly awesome New Zealand hunting experience. Hunts are offered on a daily rate + trophy fee basis allowing many more options and a lot more flexibility than wilderness hunting. All free range private land properties have vehicle access. We either stay onsite at the property or hunt from our lodge each day. The free range properties themselves have vehicle tracks (some more than others) so we can drive to certain areas and glass for animals. Sometimes we can use the 4×4 to climb right to the top of the mountain and hunt down on animals. Side by side vehicles or 4×4 motorbikes may also be used. Free range private land hunting is certainly not as harsh as wilderness hunting and with vehicle tracks we can take some of the dead walking out of the hunt. Generally we have solid footing on tussock filled rolling hill country. Terrain does vary from rolling low country to harsh alpine country with beautiful forested valleys rising up to tussock country and further again to bluff filled alpine basins.